Jake was last aboard right after Thanksgiving when we had a bit of a fire and adventure, and we had both been looking forward to returning to Poulsbo and being out on the boat again. 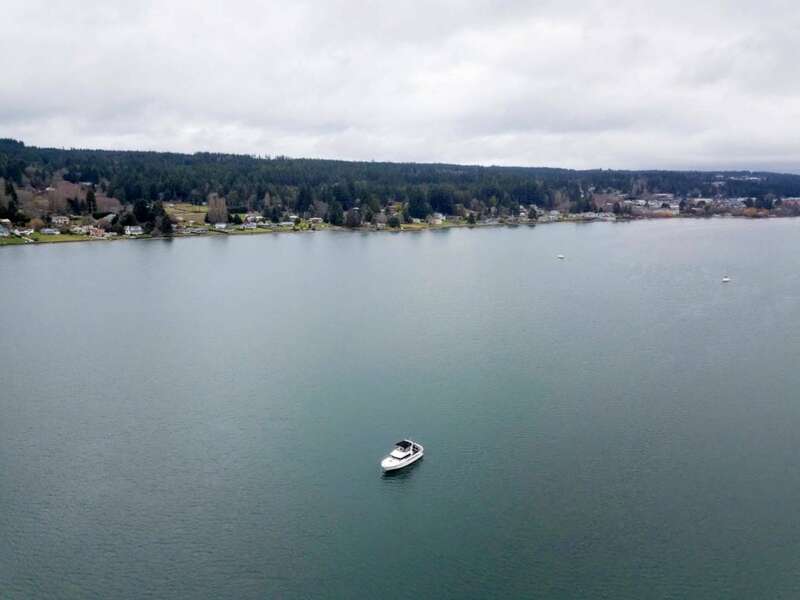 We left Friday afternoon and cruised north of Bainbridge Island, through Agate Pass, and into Liberty Bay. As in November, there were only a few other boats at anchor, so we chose a nice spot out away from the marina, and dropped anchor. I had installed a new camera system that I was testing, hoping it would be something I could integrate with my new electronics systems that I will be installing later in February. 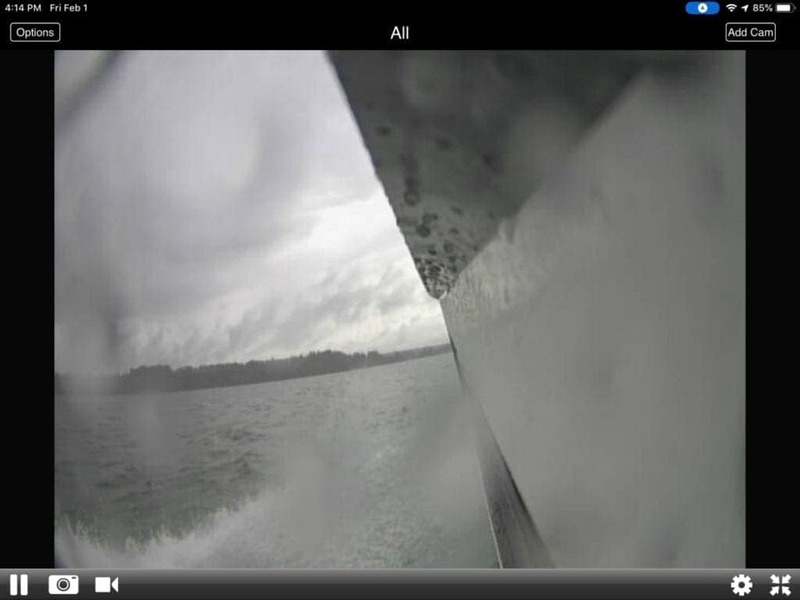 While underway to Poulsbo, I was able to see the camera in action, although the intent was to use it while docking and in close quarters. The camera is a cheaper bullet-style outdoor analog camera connected to an Axis M7014 video encoder. I chose to use an analog camera because I wanted to be able to use relatively cheap cameras of differing lens and sizes, which would be mounted in some risky areas. I also had read that the video encoder solutions are better with MFDs, specifically with Furuno, as the video processing and sizing for multiple streams is handled by the encoder. I’m going to continue testing different cameras and options before I make a final decision and install. Currently I have this camera under the port rail affixed with a 3M sticky strip and the wiring routed in through the engine air intakes. 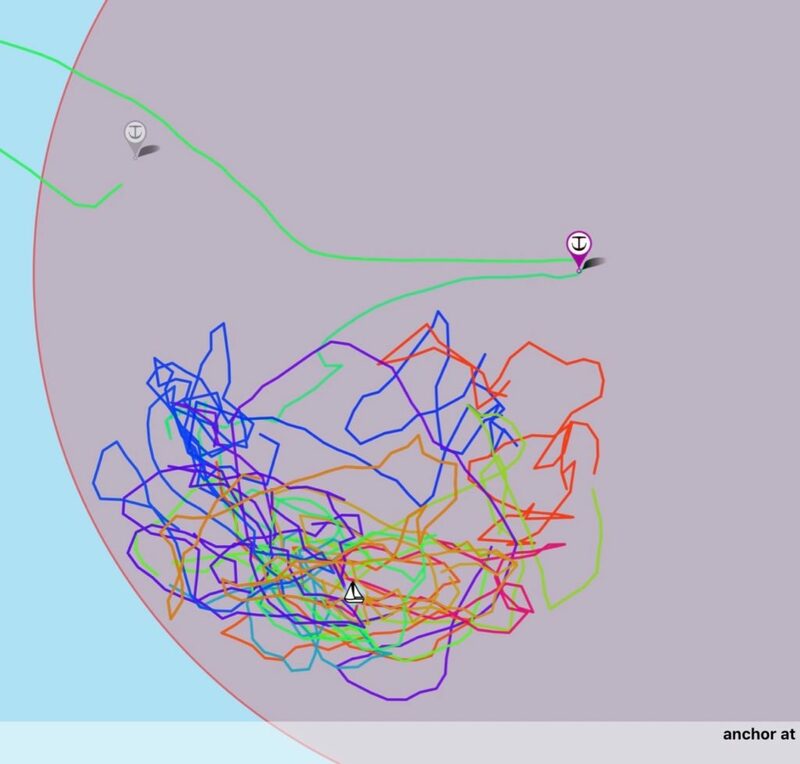 I did get the chance to fly the drone for a while – you can see how alone we are in the anchorage! I’m looking forward to having more flights this season – it is so much easier to fly off of Rendezvous with the big back deck. We were still seeing pretty drastic tides around Puget Sound, and Liberty Bay was no exception. We got down just below 7 feet on Friday night. 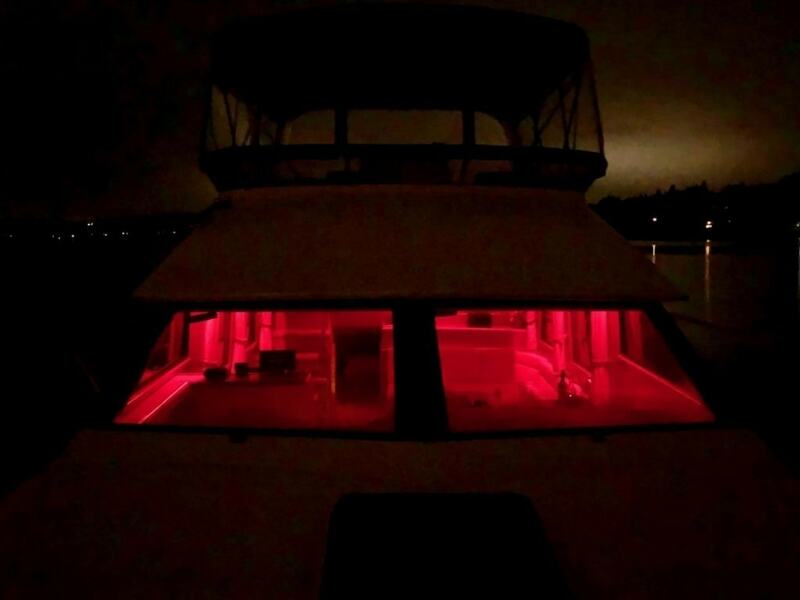 The new lighting was working out very well, and we had a completely calm night at anchor. 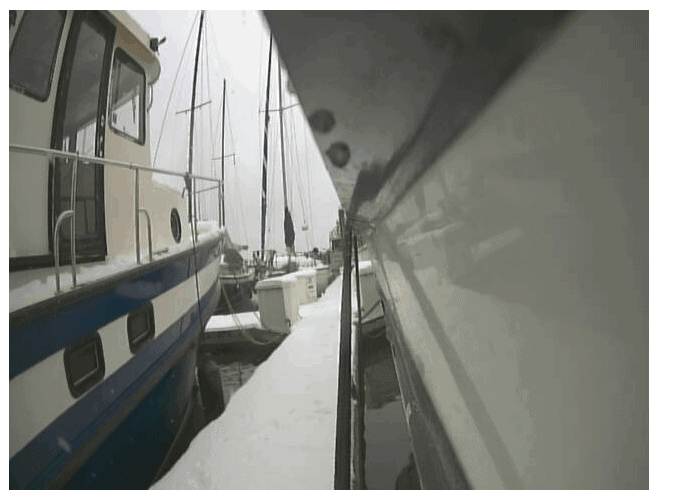 Saturday was pretty cold, but we decided to head in to Poulsbo Marina dinghy dock and tie up and explore the town. I am still in love with my Highland 10′ dinghy and how fast it goes. 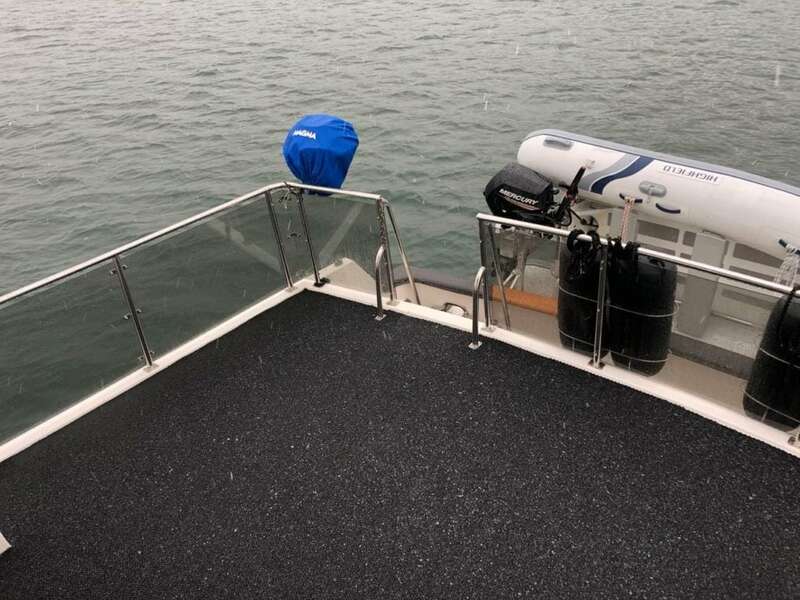 I love the aluminum hull and how light it is, and my favorite feature is the integrated bilge, which keeps any water that gets into the boat separate from where you stand. 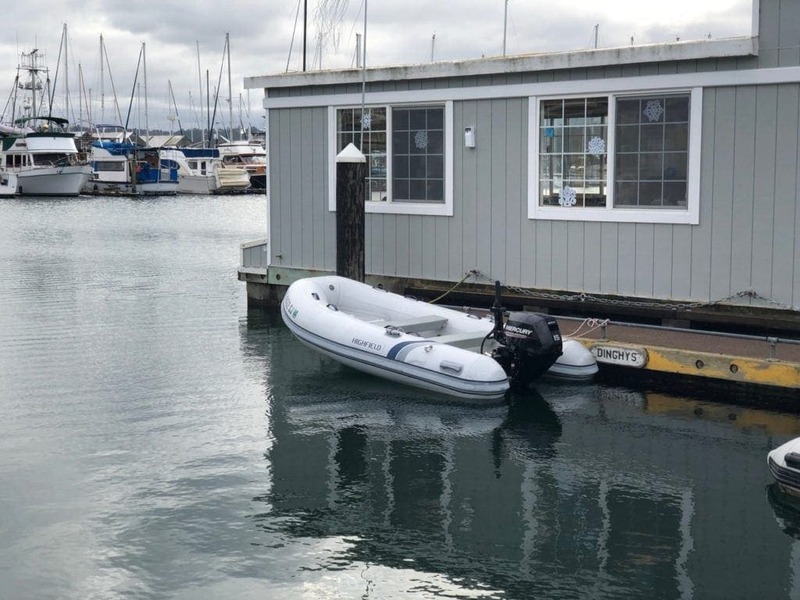 I’ve also learned a lot about the new Mercury EFI outboard, and how little maintenance there is even compared to the previous versions of 4-cycle outboards. Of course, you have to stop at Sluys Bakery when you’re in Poulsbo. 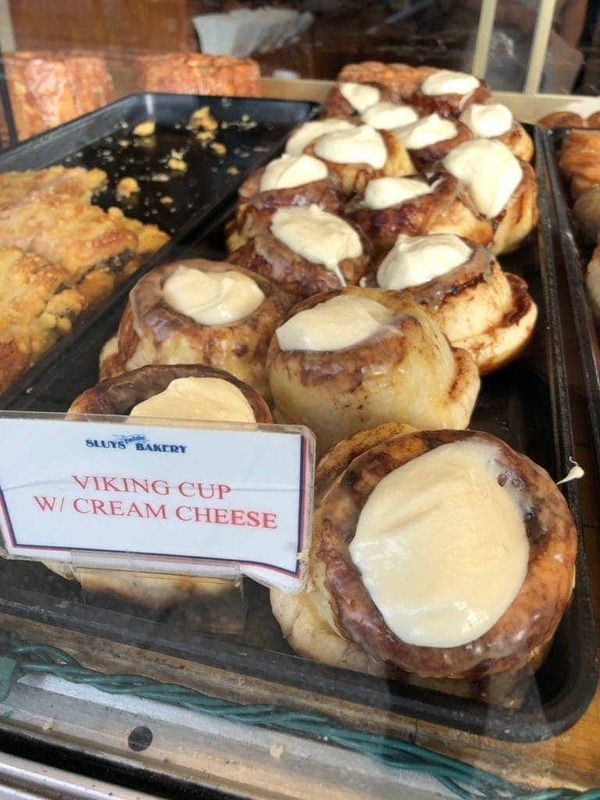 My favorite thing is the Viking Cup, which is essentially a partially hollowed out cinnamon roll with wonderful icing inside the cavity. We also stopped into the Marina Market which has an extensive selection of Scandinavian food and supplies. 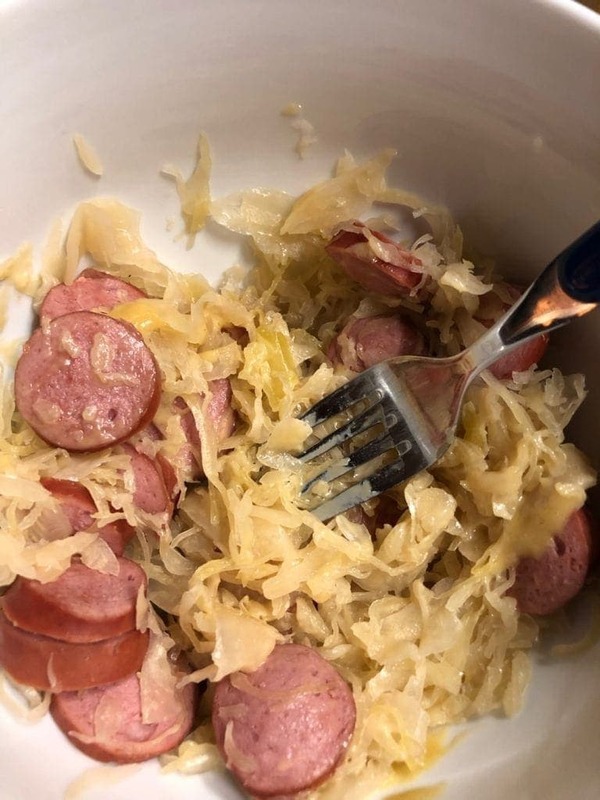 Jake and I had enjoyed some knockwurst and sauerkraut the last time we were here, and went back for the same thing again. I guess our Nordic roots came into play! 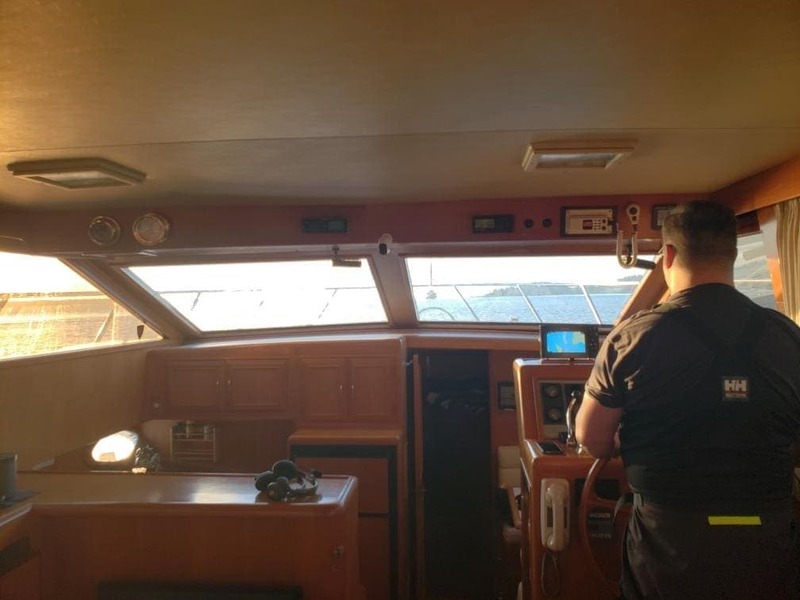 I had been watching the weather very closely the entire trip, and we had plans to leave around 1PM on Sunday to ensure we avoided most of the wind in the channel. There was a good 6 hour window to get home from noon onwards, but things started looking a little sketchy and the NOAA radar showed some snow/rain showers moving in from the south, so it was time to go. 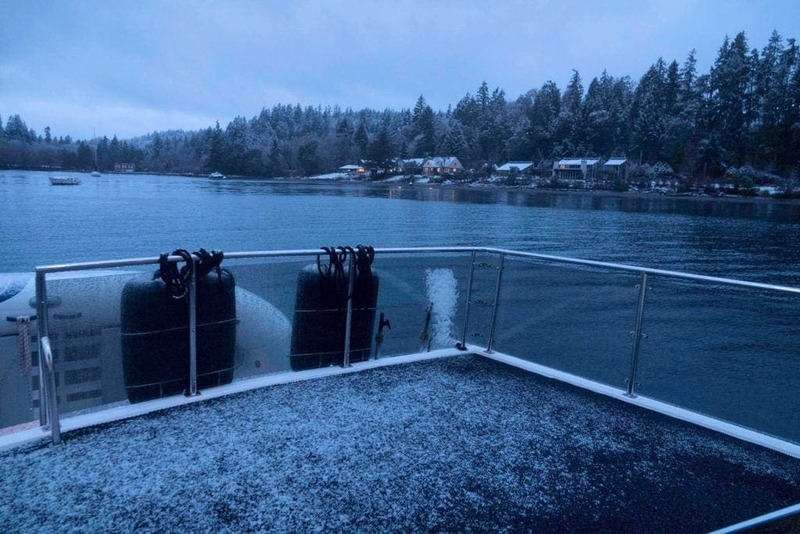 By the time I had the anchor up, snow was falling on the sun deck. As soon as we exited Liberty Bay, things started deteriorating pretty fast. Visibility dropped to about a mile, and heavy snow started falling. The wind was gusty, but not too bad. 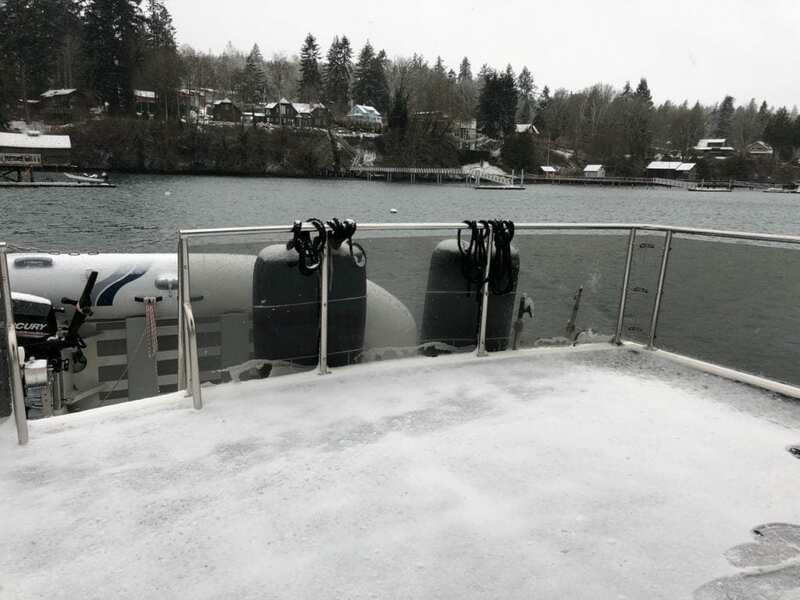 The flybridge started icing up a bit more, and visibility dropped even further. I had sold my radar, and was waiting on the new one to arrive, so we slowed and used eyeball 1.0 to watch for traffic. I had opted to head south through the channel to Rich Passage instead of going back around the north end of Bainbridge, mainly because of the wind direction and waves. As we exited Rich Passage, both the upper flybridge and lower salon driving stations became mostly unusable. White out snow conditions combined with half melting snow that froze on the windows rendered our visibility very poor. 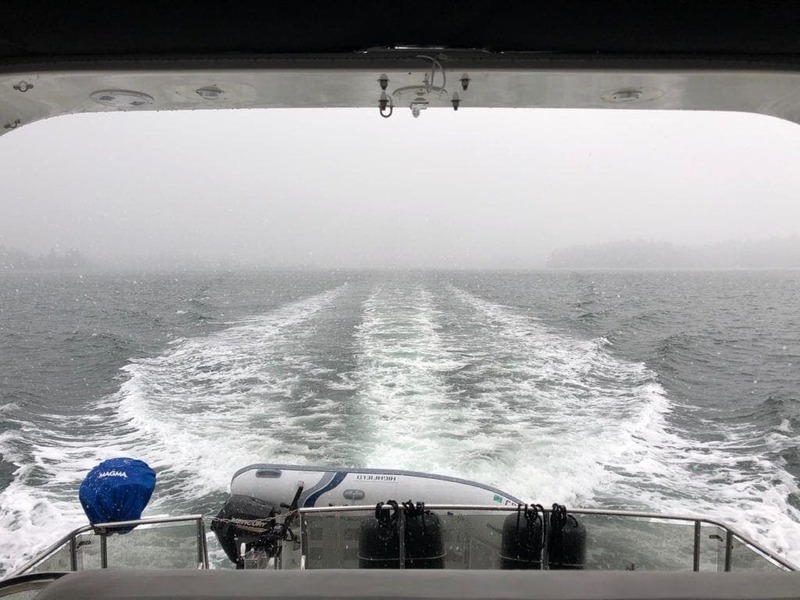 Waves started to build, and as we got closer to rounding the southern tip of Bainbridge, were quite large at 4 feet, with larger ones rolling in every so often. 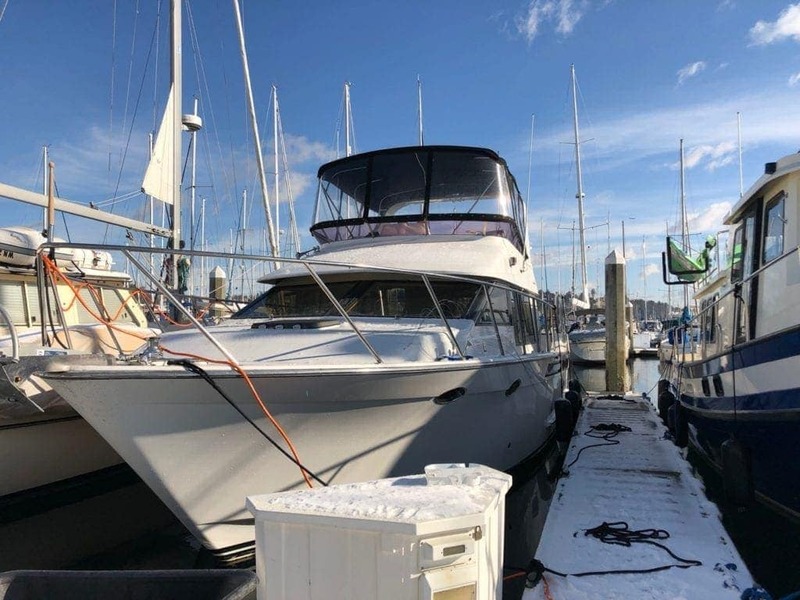 I tried using body heat and other means to defrost the flybridge windows, but it was to no avail. The salon was marginally better, but the temperatures had dropped so quickly that the interior fogged up quickly. I went out onto the bow while we were at idle and cleaned all of the ice off the windows, but it was clear we needed to get to a safe place. Jake worked the squeegee on the interior windows while we pounded through what now was about 25 knots of wind and 4-6 foot waves. The boat could handle this weather, but being new to me, docking in this sort of weather was not something I was confident in. Besides, we were only just entering the channel, and had about 40 minutes to cross all of the ferry lanes and get back to the marina. I didn’t think it was safe to continue, so we diverted into Blakeley Harbor. 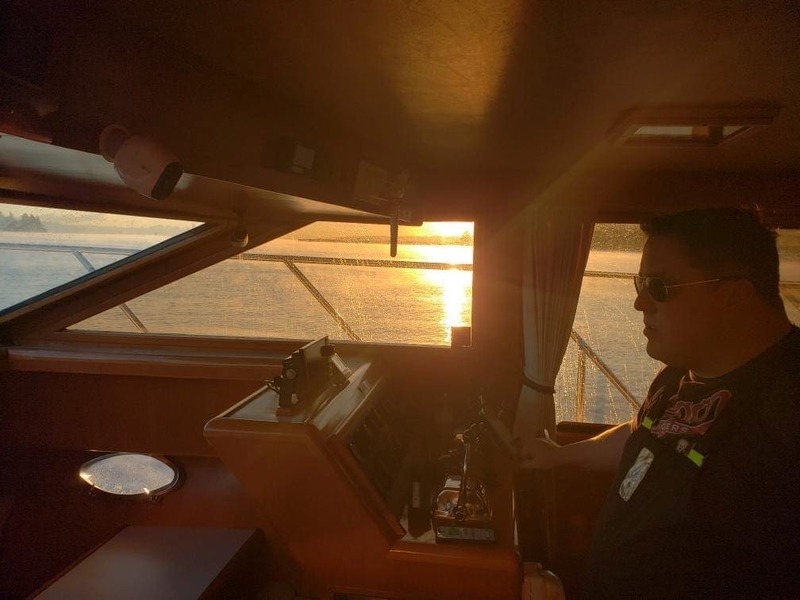 Unfortunately Jake got really seasick with the motion of the boat while he kept the windows clean for me to navigate, so as soon as we anchored, he went to rest. I kept reviewing the forecast and real-time wind reports, but it did not look good for any further movement on Sunday night. The snow started to accumulate, but I wasn’t too worried about that. Blakeley is pretty deep, and we were in about 45 feet of water with 200 feet of chain out. I’ve anchored here many times before and not had any issues. Soon it was obvious this storm was a bit different. The wind came from all directions of the compass, and would be hardly anything, and then 20 knots. We spun around constantly and could never figure out where the wind was coming from. 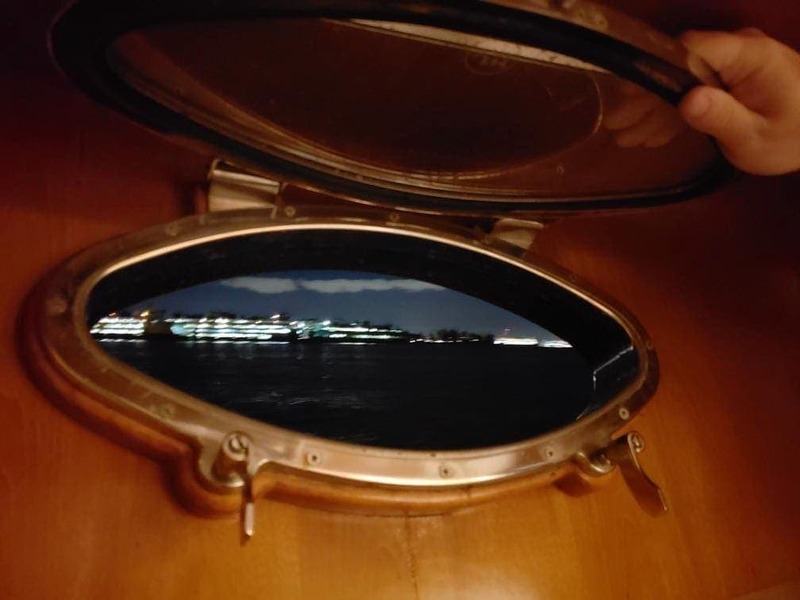 On top of that, the big waves were getting bigger, and bouncing off the shore out in the entrance of the harbor, and reflecting deep into the anchorage were we were. By now it was very dark, and I did not want to try to move or get home with the bad weather. Thus began one of the worst nights on anchor that I have had in recent memory. Spinning around endlessly with the wind, combined with rolling waves coming from several directions, making the boat roll side to side a ton. Jake’s seasickness got 10x worse, and I was well on the way to being sick. We spent all night in the harbor, but slept very little. At 7AM, I was up prepping the boat to move to Eagle Harbor, only 3NM away, with only about 1.5NM exposed. 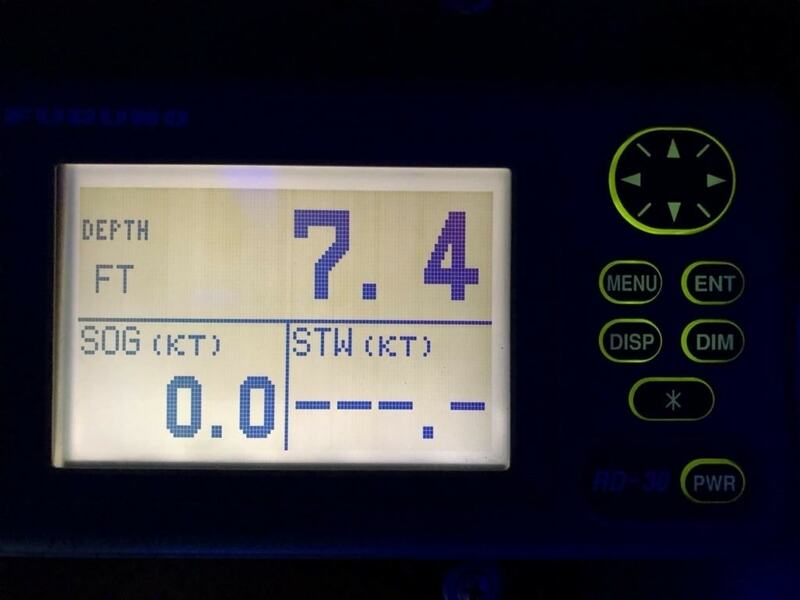 The waves looked pretty big from what I could see, and the winds were sitting at 30 knots at the West Point buoy. However, I was concerned about us becoming very sick at our current anchorage, and the waves and wind were increasing in the harbor, so dragging was a potential possibility. 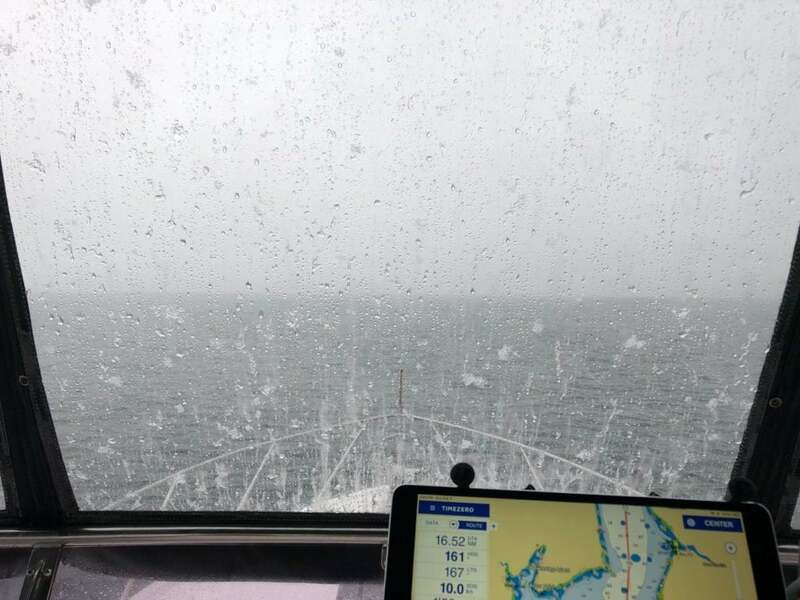 We pulled out of Blakeley Harbor at 8AM on Monday into 6-8 foot waves and 30 knots of wind, gusting to 35 knots. Rendezvous didn’t even falter – I throttled up to 12 knots, and she just plowed directly through the waves, which were coming directly towards us from the north. Jake was watching the water for debris while I stood at the flybridge helm and worked the throttles and steering to surf us up and down the big waves. A couple were much larger than 8′ and we had to slow down to pound through them, but there was never a time I felt out of control, or that I couldn’t deal with things. After about 15 minutes in the big waves, we entered the harbor, passed an early morning commuter ferry, found a spot to anchor amongst a bunch of moored boats, and had a nice breakfast. It continued to snow, and the wind was a lot stronger here than Blakeley, but it was consistently coming from the north, keeping us pointed the same direction. This anchorage was so calm compared to Blakeley Harbor, we were in heaven! We had nice long naps, knowing that the winds were not going to slow down all day, and that I wasn’t comfortable crossing or docking in them. PredictWind showed gusts into the 40 knot range, but I never saw sustained winds less than 35 knots most of the day, with gusts well beyond 40. The sunset was beautiful, but the wind chill was not. We were seeing temperatures in the mid 20’s with wind chills in the low teens. Our Webasto diesel heater was running constantly since we had no protection from the wind. 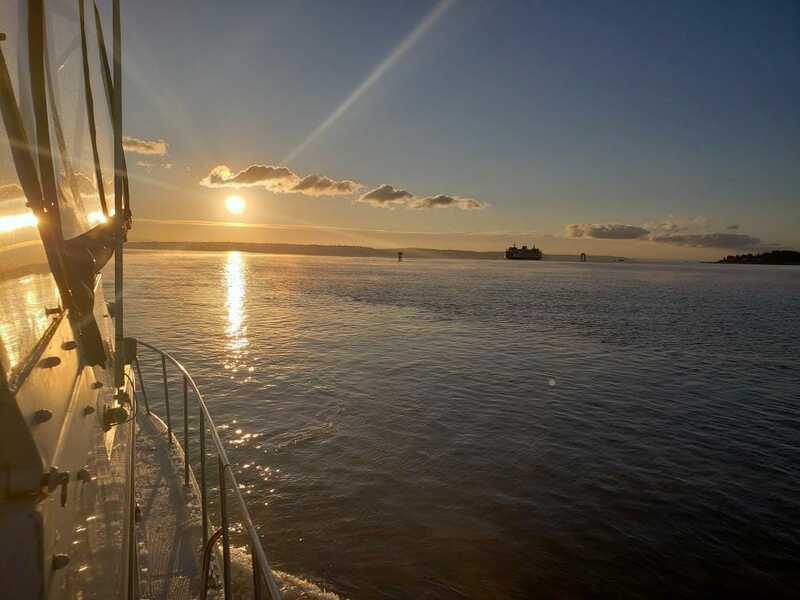 We had a nice steak dinner, watched the ferries come and go, and enjoyed a calm anchorage with pretty views of Seattle. The snow stopped, and we were able to see the Seattle skyline – our destination in the morning. The forecast showed a good 8 hour window of light winds from 4AM-noon. We were up at 7AM, and underway by 7:45. 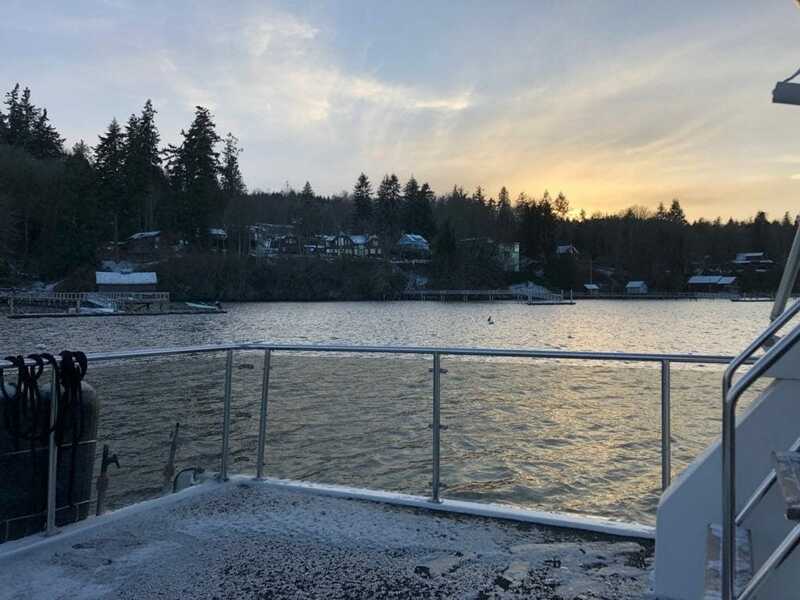 After waiting for the big Bainbridge Island ferry to depart, we followed her out to completely flat seas and a beautifully sunny, albeit cold, morning. This was the second time I had been driving from the salon station during the trip, and while I had been told this was not a likely driving position, I have found myself appreciating the location more. You can see that my visibility is not amazing, but I can still see very well while standing. The previous owner removed the windshield wipers for some reason, and the motors are not working, so there is some work to do if I want to use the location with bad weather. The rest of the crossing was uneventful, and I even docked us in our new slip without too much drama. 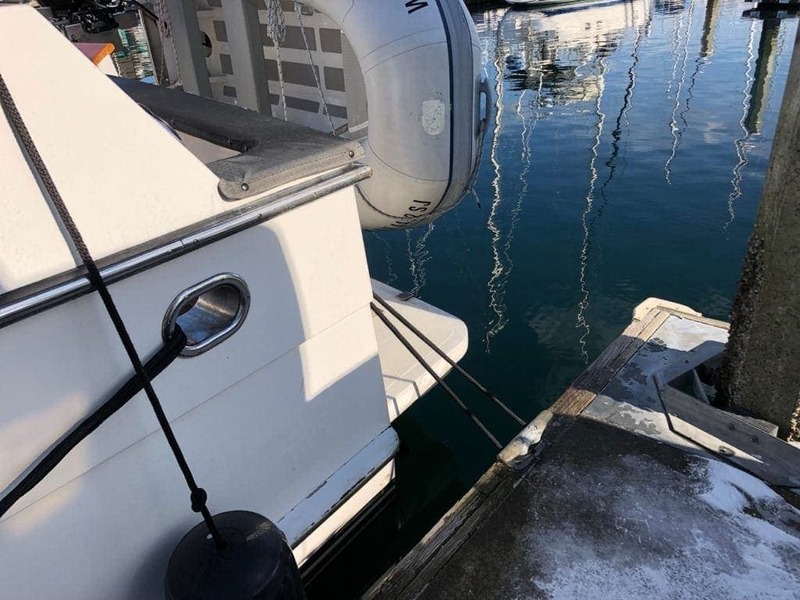 I had chosen to move to a slip with a sailboat neighbor, which allowed a bit more room when first entering the slip, and also a different side of the dock which meant that in a north wind, I would be blown onto the dock while docking, which is very common in the summer. It also looked like the fairway was slightly larger (it was) which is important, as my marina has super narrow ones. 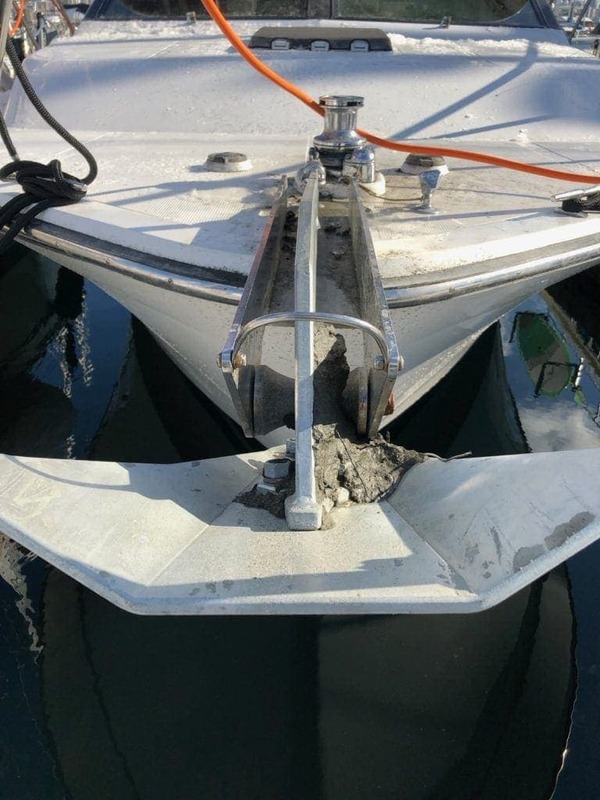 The other super nice surprise was that the slip was slightly deeper, which means that I can use the stern hawse hole to run the stern line out, which makes the boat set better against the dock, and easier to get on and off since the piling isn’t right at the swim step. It is little things like this that make the captain happy. 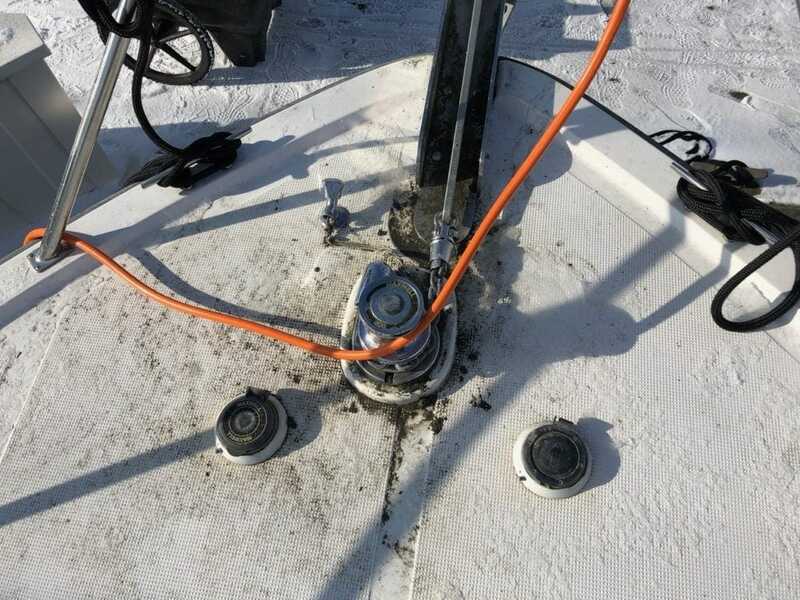 After two rough days at anchor in super cold windy conditions, the foredeck was very dirty since we did not have someone washing things off in that cold weather and exposed to danger while pulling anchor. A quick wash at the dock helped. The new anchor, swivel and chain hook + bridle has been working very well the last 3 months. In fact, the Mantus anchor has held so well everywhere we’ve gone that I have to drive the boat over it to get it to release. 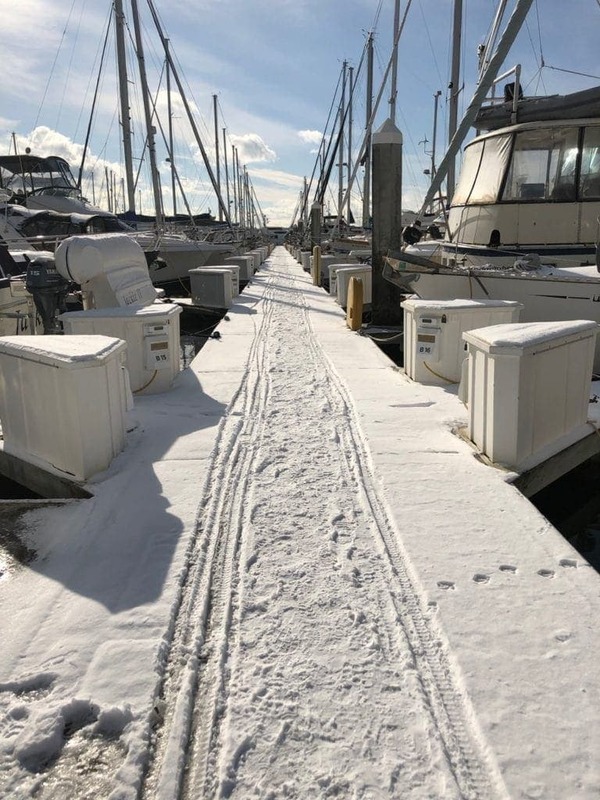 The docks were pretty snowy and icy, and after getting Jake on his way, I cleaned things up, and headed home myself. It was a fun and adventurous 4+ day trip with beautiful snow views, and a bit of excitement. I was super pleased with how Rendezvous handled the heavy weather and cold temps, and glad I made the choices I did to keep us safe. I heard several boats running across late Sunday that were not having a fun time. I’m looking forward to more winter cruising!